While many are looking forward to Intel's Sixth Generation Skylake CPU for its improved processing performance and power efficiency, the chip's graphics may be its most underestimated asset. With Skylake, Intel's Gen9 integrated graphics not only brings significantly better graphics performance to the average computing users, but Intel is also setting its sights on usurping the role of dedicated graphics, like those from Nvidia and rival AMD's Radeon line. 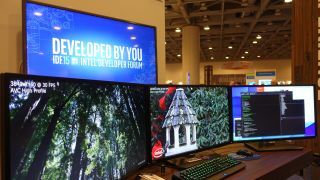 Intel hasn't released specifics about Skylake or its integrated Gen9 graphics at IDF 2015, opting instead to focus on wearables, RealSense and the Internet of Things. However, Intel has made significant progress with boosting its integrated graphics, two Intel insiders told techradar independently, which will "soon result in Apple transitioning its MacBook Pro [solely] to Intel graphics." Today's most expensive 15-inch MacBook Pro configuration comes with a discrete AMD Radeon R9 M370X graphics, but that may no longer be the case in the future if our intel on Intel is accurate. When pushed if this will happen in time for Apple's Skylake refresh, our sources would not offer additional details. Apple reps have not responded to our request for comment. Winning over Apple will be a major coup for Intel in validating the power of its integrated graphics, which has been seen in the past as lagging behind dedicated graphics. Notorious for its attention to detail and focus on providing the best user experience for its customers, if Apple adopts Intel's solution on its professional notebooks without requiring Nvidia or AMD Radeon for backup, it will be the second major stamp of approval for Intel. Apple gave Intel its first nod when it switched from Power PC processors to Intel's x86 chips, which are now found on the company's MacBook, MacBook Air and MacBook Pro laptop lineup as well as on desktops like the Mac Mini, iMac and Mac Pro. This would be an especially important win for Intel because many graphics and video professionals rely on Apple's MacBook Pro to do production work. It would show that Intel's solution can at the very least match the performance of the AMD Radeon R9 on this generation's 15-inch MacBook Pro or the Nvidia GeForce GT970M on the prior generation model. In the past, Apple chose to rely on Intel's premium integrated graphics architecture on its notebook line. Whereas PC rivals often use Intel HD graphics, Apple uses Intel's higher-end Iris or Iris Pro graphics. The role of dedicated graphics would still be important on workstations, gaming rigs and dedicated mobile workstations, but Intel appears confident that Skylake will be powerful enough for the majority of computing users.